On its last day before getting shipped off to Paris, I took the elevator to the 6th floor of the very crowded Wallach Art Gallery to see Posing Modernity. The exhibit was curated by Dr. Denise Murrell and highlights the role black women played in the development of modern art after Manet’s Olympia. It starts by looking at the Parisian modernist movement and transitions into a portrayal of black women during the Harlem Renaissance and modern day art. It’s very uncommon in (European) art history to see people of color, especially women. Even less common, is seeing them being represented as beautiful. For centuries, art was yet another space in which black and brown bodies were marginalized and treated as “other.” In Posing Modernity, there are no paintings in which women of color are represented in a fetishized or caricatured manner. Instead, Dr. Murrell shows us that early impressionists were painting free black Parisian women in the same ways they painted white European women. I was especially struck by an early drawing of Miss La La, an acrobat at a circus. When I read ‘circus’ my mind immediately thought of freak shows and human zoos, and I feared for the worst. Instead, there’s a sketch by Degas in which Miss La La is is represented as a strong yet dainty performer (her crossed feet and ballerina hands!). Googling the image later, I realized it’s a painting I’ve seen so many times before, but never was the race of the model discussed. It’s wild to think of how we are quick to ignore the presence of black women in art, even when they’re the only person in the picture. Instead, I remember studying this image for its unusual angle - this stark shift was one of the features of impressionism that set it apart from the rest, marking it as the first period of modernism. This is also how Dr. Murrell described the first time she learned about Manet’s Olympia. 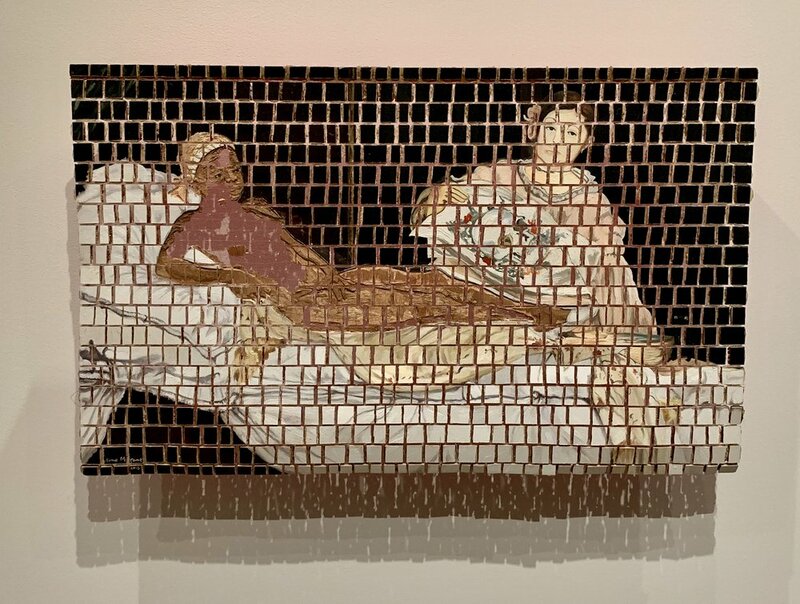 Her professor went on in detail about the white model staring directly at the viewer, and didn’t even mention the black servant in the image. Turns out that the black woman is Laure, a model Manet would go on to paint in two other times. That experience served impetus for her Doctoral thesis and the idea behind Posing Modernity. I’ve been thinking about this exhibit for days, and every time I find something new I enjoy about it. There’s something very special about a show that unveils something completely new; it’s empowering and hopeful. If you got a chance to visit it, I’d love to know what you thought! The drawing of Miss La La by Degas, and the final painting. Laure, the maid in Olympia, gets her own portrait. One of my favorites: Girl in a Red Dress, by Charles Alston, done in 1934. Two nannies and the children they’re taking care of. This is one of my favorite images, it transmits so much warmth. The model on the right is not only seen as an equal to her white counterpart, but she carries the most weight in this painting. Her tall posture, warm smile, and the vibrant color of her skin and clothing standing out against the dull beige and grey background, she looks beautiful and regal. I was so, so impressed with how talented the performers were. They created entire narratives, storylines, songs… all from random words the audience would shout out. It was basically an improv show but with hip hop rhymes — making it infinitely more challenging! They’re doing a very limited off-broadway performance, 6 weeks only. If you by any chance are able to get tickets, GO. It’s so worth it.